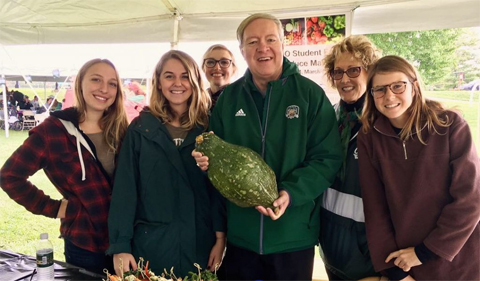 President M. Duane Nellis at the College of Arts & Sciences Homecoming tent holding a giant Hubbard Squash grown at the OHIO Student Farm. From left: Allison Paolucci (Plant Biology Food Studies Graduate Assistant), Joy Kostansek (Food Studies Graduate Assistant and Sociology), Jen Vanderman (B.S.S. ), President Nellis, Dr. Theresa Moran (Director of Food Studies), and Rachel McDonald ( Food Studies Student Assistant). 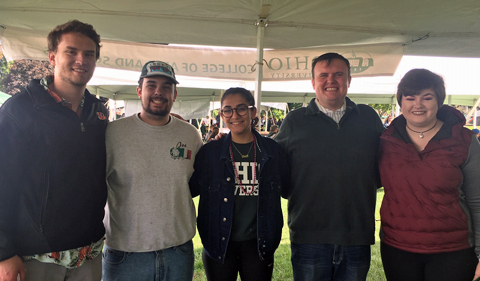 Ohio University President M. Duane Nellis, alumni and VIPs stopped by the College of Arts & Science’s tent during Homecoming 2018, getting a taste of student-grown produce, talking to alumni, and learning about Ellis Hall renovations and the new chemistry building through a virtual tour. 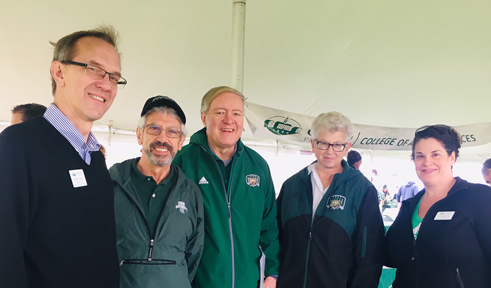 From left, Interim Dean Joe Shields, Dr. Bob Colvin, President M. Duane Nellis, Ruthie Nellis and Dr. Sarah Poggione. He sampled fresh vegetables and dips straight from the OHIO Student Farm, just a half mile away from Tailgreat Park—a truly zero kilometer meal. President and Mrs. Ruthie Nellis also enjoyed a Hubbard squash dip, the result of a delicious collaboration with Food Studies theme and the Atrium Café, courtesy of Chef Dane Salabak. Mayor Steve Patterson takes a virtual tour of the new chemistry building with Dr. Steve Bergmeier. The president heard from Food Studies students about how the vegetables were harvested, washed and prepared the day before. The students also talked about how the farm featured in their academic work and how the experience of working on the farm has enriched their time at OHIO. 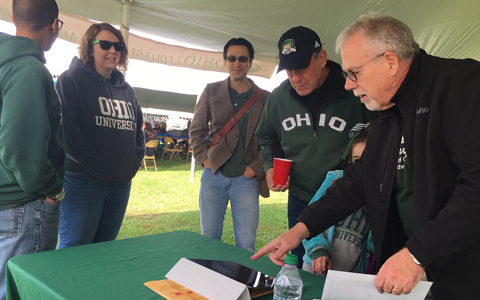 Athens Mayor Steve Patterson at the College of Arts & Sciences Homecoming tent. Community visitors also stopped by to try tasty vegetables and dip and learn about the building projects. 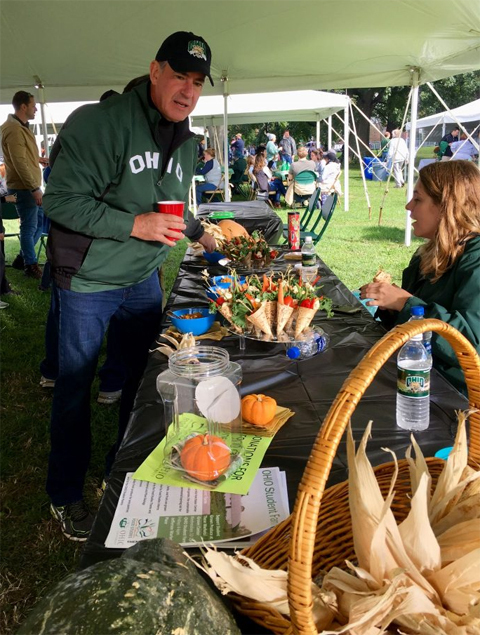 Athens Mayor Steve Patterson, chatted with Food Studies students and Food Studies Director Dr. Theresa Moran about town-gown collaboration on President Nellis’ sustainability goals. 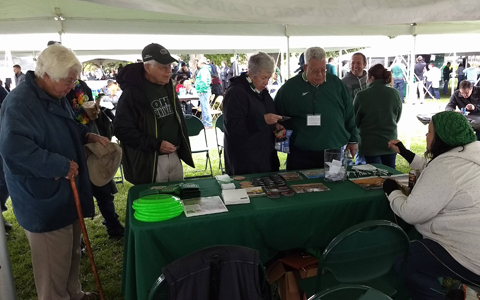 Alumni check in at Homecoming tent. Rufus hears about the new chemistry building with, from left, Dr. Justin Holub, Dr. Travis White, Dr. Steve Bergmeier, Dr. Jessica White and Dean Joe Shields. And Rufus showed up for extra-large helping of Hubbard squash. Rufus stops by the College of Arts & Sciences tent and samples Hubbard squash. 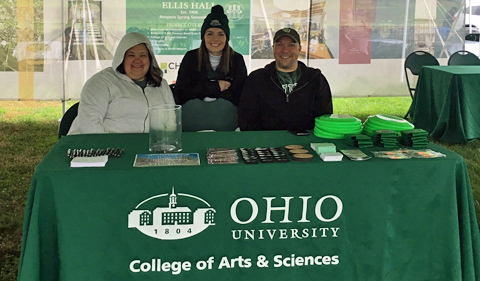 The crew welcome folks to the College of Arts & Sciences tent.